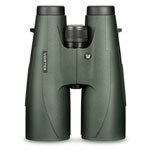 Vortex is the synonym for premium optics with affordable price tags and Vortex binoculars have the same story to say. They are the ideal choice for those who wish to enjoy the clarity of premium glass sans a heavy price. The Vortex binocular range is prescribed for activities like hunting, bird watching, hiking, landscape scanning and other applications that take into account long distance viewing. The range offers a powerful viewing experience thanks to the presence of HD (High Density) extra-low dispersion glass and fully multi-coated lenses in its list of attributes. It is crafted to yield intensely bright, sharp images without compromising on the resolution of the image and at the same time eliminate obscurity. Rugged, compact and lightweight, the entire Vortex binoculars range has been made to pass rigid tests to make them score high on the durability and reliability meter. The binoculars have even received the "Best of the Best" Award in 2007 by Field & Stream magazine due to their marvelous technology and unbeatable performance. All in all, an ideal option for all those who need a pair of binoculars that are as crazy as they are! Take a look.